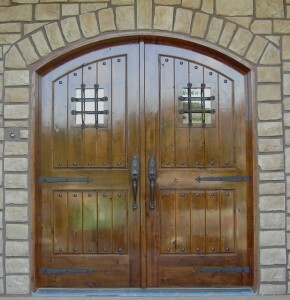 As much as we use our wood front doors, we don’t really think much about whether we need to replace it. Part of this is due to the fact that a well-maintained door could last for decades, but do you remember the last time your door was replaced? Replacing your door also has benefits for the energy efficiency of your home as well. Scratches, dents and an overall weathered look are some of the signs that your front door may be detracting from the beauty of your home. Replacing your old door with a new one is a great way to improve the curb appeal of your home. The front door is the first and last part of the house that guests will see. Another issue that serves as a great reason to replace your wooden exterior doors is when you feel a cold draft from the doorway. You could replace the weather stripping, but the door itself could also do a better job insulating the home if it has a higher “R” value. Simply put, leaving old doors as they are could potentially increase the cost to heat or cool your home. Depending on how bad the draft was, you could even recoup a sizeable portion of the renovation cost from the increased heating efficiency. One of the biggest reasons, however, is that renovating the entryway of a home typically has the best return on investment of all home projects if you decide to move out. Bio: ETO Doors is a custom door manufacturer from Los Angeles that offers industry leading doors, made of high-quality wood, at warehouse prices.